Take the chipotles out of the can and remove the seeds. Place the chilies into a blender and add any remaining juice from the can. Juice the limes into the blender and add all of the remaining ingredients. Blend and taste. It is very spicy. Add more lime, honey, and/or sour cream to your taste or to tone down the heat level. 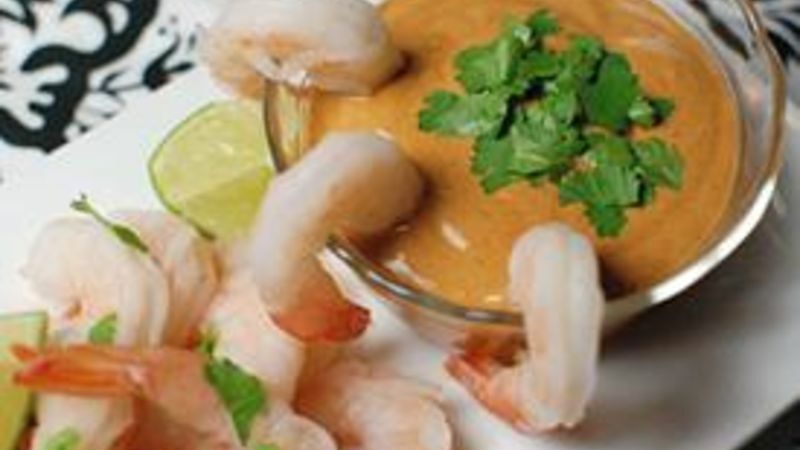 Garnish with cilantro, serve with shrimp! I had to check Wikipedia just to make sure I could officially call this cocktail sauce. Turns out cocktail sauce can contain a very wide variety of things, from staples like ketchup and horseradish to things I didn't expect like sour cream, Worcestershire, and even whiskey! This honey chipotle lime cocktail sauce has all the makings of a great dip. Salty, sweet, spicy, and sour come together to make the perfect bite every time. I even used leftovers on tacos the next night. The first step is to prep your chipotles. Take them out of the can one at a time, open them up, and scrape out as many seeds as you can. Then put them into the blender and add in all the juice from the bottom of the can. Even after discarding all the seeds, the sauce is still going to be very hot. Into the blender with these chipotles go lime juice, honey, garlic, and sour cream. This little dip packs a lot of flavor! It is really spicy, so feel free to taste it and add some more sour cream, honey, and/or lime juice to tone it down or customize it to your personal tastes. Dan Whalen thinks more people should experiment with cocktail sauce. He has been blogging for almost 4 years at The Food in my Beard; check Dan's Tablespoon profile often to try his recipes with creative international spins!